It’s our favorite time of the year! Black Friday deals and sales! I’m going to be updating this post throughout the week, so check back often as the deals come rolling in. The Tomayia Colvin Education 2019 One Year Annual Pass is here for a savings of 40% off! Monday, November 20-Monday, November 26 save BIG! What’s included: Access to all of our courses in our learning library! Pricing for Profit, In Person Sales, Lighting, Posing, Videography, SEO, Editing African American Skin Tones, Blogging, Pinterest for Photographers, Accounting, Taxes, Boudoir, Birth, Newborn, Seniors, Personal Projects, and much more! All for one low price of $159! Learn at your leisure via the mobile app, your tablet, or computer. Take advantage now! Use Code “BLACKFRIDAY”. Check it out here. Our friends at MagMod knows everybody loves FREE STUFF. They’re giving Black Friday early birds free gift cards with orders over $300. Shipping is free all weekend long, too. Icing on the cake: up to 20% off thru Cyber Monday. Woo hoo! We ♥️ magnetic modifiers! So we’re stoked MagMod is doing Free Shipping + Free MagBucks + Up to 20% Off this weekend. Time to stock up. 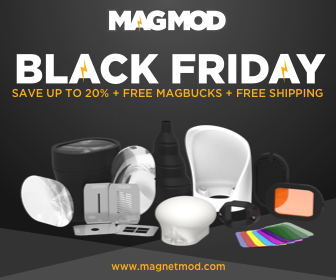 Pro Tip: If you love magnetic speedlight modifiers as much as we do, check out our pals at MagMod on Black Friday. They’re doing Free Shipping + Free MagBucks + Up to 20% Off. Tomayia uses Rebookü for her image extracting for our sports images. She’s previously used them for album design as well. Great company. Supercharge your editing with DVLOP's best deal of the year! Save 50% off your first order with Photographers Edit! Triple Scoop Music has an incredible Black Friday promotion that is happening now through Nov 30th and saves a giant 70% on unlimited music licensing memberships from Triple Scoop Music, it’s the biggest and best offer they've ever done. Wahoo! Take advantage of 20% off the first month or year. Dubsado! Check it out!